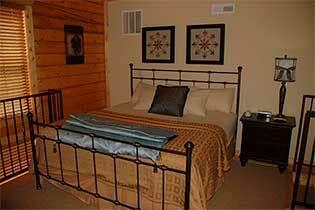 Looking for lodging in Branson? 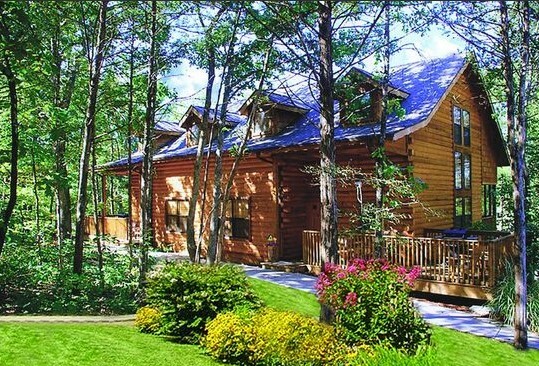 Branson’s Thousand Hills Cabins at Grand Mountain lets you stay in the rolling hills of the Ozarks without leaving the city! 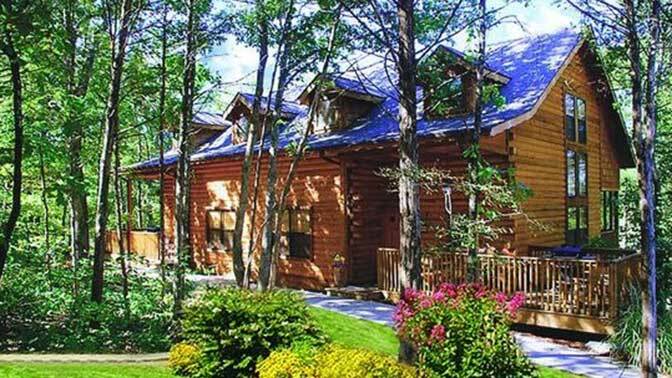 These charming, log cabin-style, duplex units have one, two, or four bedrooms and provide all the features you look for in luxury lodging. You also have the option of staying in a two bedroom cottage, a two bedroom cabin with a loft, or a four bedroom cabin with a loft and three bathrooms. 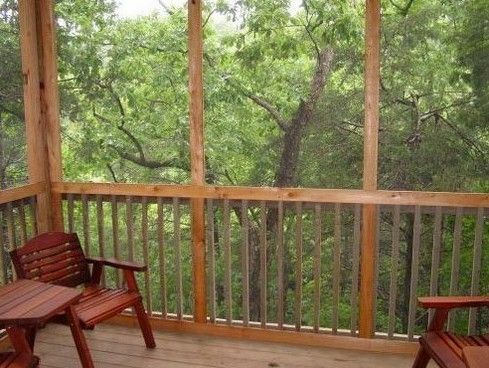 The surrounding trees and other foliage deliver a sense of privacy, and make for a relaxing view from your private porch. 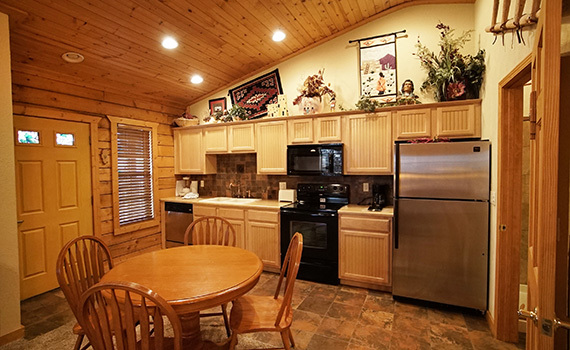 Each cabin is uniquely decorated, but all offer similar amenities, including fully equipped kitchens, comfortable living areas, complimentary WiFi, premium cable television with a DVD player, jetted tub, fireplace, pull-out sofa sleeper, washer/dryer, and there’s a television located in every bedroom. Property features are numerous at Thousand Hills registration/conference building area, just a couple minutes from your cabin. There you’ll discover an indoor pool, tennis courts, a fitness center, meeting space, a business center, and one of the area’s best golf courses, complete with a well-stocked pro shop. 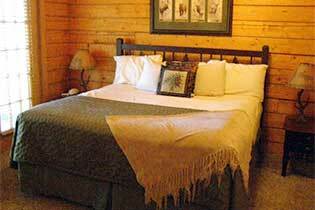 All this makes Thousand Hills the perfect choice for lodging in Branson. 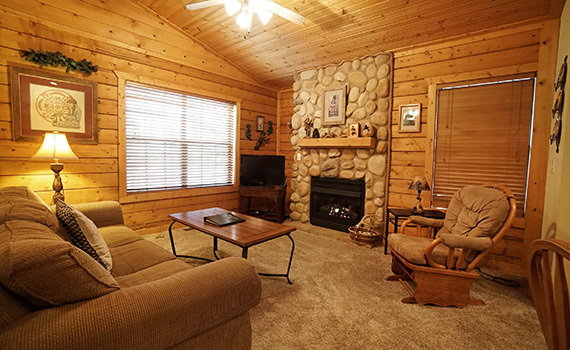 Regardless of which size cabin you choose for your next Branson visit, it’s sure to be love at first sight when you arrive at the Thousand Hills Cabins at Grand Mountain! Don’t forget to ask about a multi-night discount; your Branson Tourism Center vacation planning specialist will be happy to help! 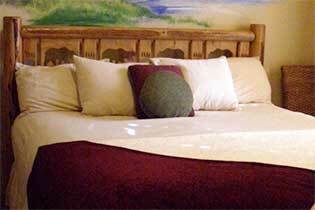 Find out about the lodging in Branson, along with shows attractions and more, with Branson.com. *These features are located at Thousand Hills’ registration/conference center building. Find out more about Branson resorts with the Branson Tourism Center. Our one bedroom studio cabins are most comfortable and uniquely decorated. These units feature a fully equipped kitchen, spacious living area, couch, table, chairs, washer, dryer, electronic door locks, furnished linens, deck area, two-person whirlpool jacuzzi, queen size pull out sleeper, television with cable tv, DVD, and private bath. 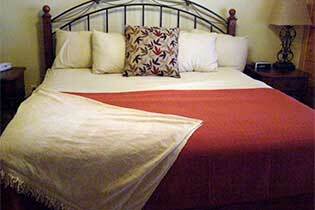 Our bedrooms offer a king size bed, television with cable tv, and gas fireplace. Dish and clothes detergent also provided. 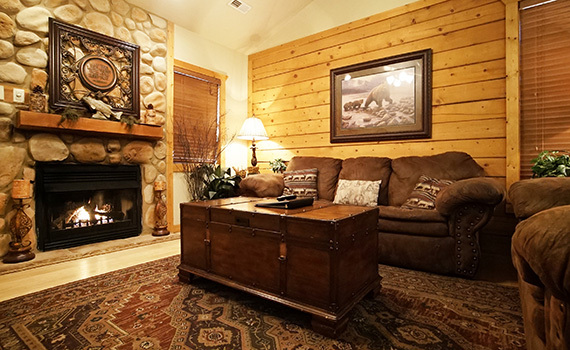 Our two bedroom cabins are most comfortable and uniquely decorated. These units feature a king bed, a fully equipped kitchen, spacious living area, couch, table, chairs, washer, dryer, electronic door locks, furnished linens, deck area, one-person whirpool jacuzzi, queen size pull out sleeper, television with cable tv, VCR, and two full private baths and fireplace. Our bedrooms offer a king size bed in each bedroom, television with cable tv, and dish and clothes detergent also provided. Our one bedroom studio cabins are most comfortable and uniquely decorated. These units feature a fully equipped kitchen, spacious living area, couch, table, chairs, washer, dryer, electronic door locks, furnished linens, deck area, two-person whirpool jacuzzi, queen size pull out sleeper, television with cable tv, DVD, and private bath. 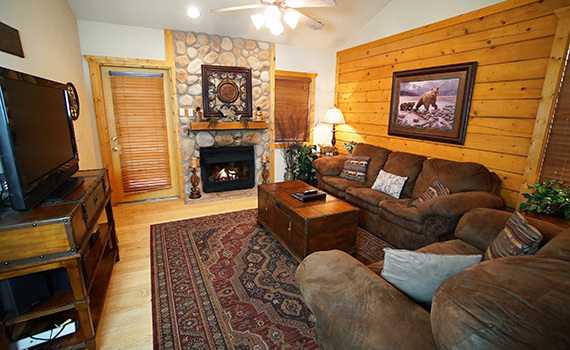 Our two bedroom cabins are most comfortable and uniquely decorated. These units feature a fireplace, king bed, a fully equipped kitchen, spacious living area, couch, table, chairs, washer, dryer, electronic door locks, furnished linens, deck area, one person whirpool jacuzzi, queen size pull out sleeper, television with cable tv, DVDVCR, and two full private baths with rain showers. 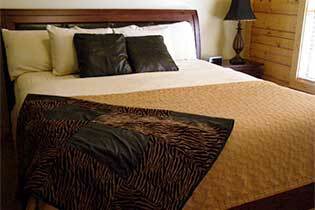 Our bedrooms offer a king size bed in each bedroom, television with cable tv, and gas fireplace. Dish and clothes detergent also provided. 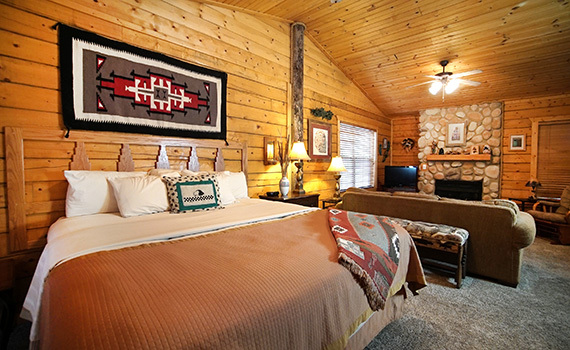 Our two bedroom cabins are most comfortable and uniquely decorated. These units feature a fireplace, fully equipped kitchen, spacious living area, couch, table, chairs, washer, dryer, electronic door locks, furnished linens, deck area, one person whirlpool jacuzzi, queen size pull out sleeper, television with cable tv, DVD, and two full private baths with rain showers. Also includes loft area with king or queen bed. 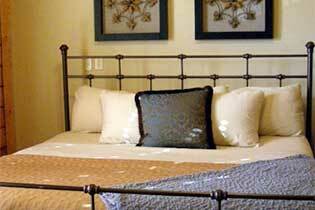 Our bedrooms offer a king size bed in each bedroom and television with cable tv.Dish and clothes detergent also provided. Four bedroom cabins have four private bedrooms and two sofa sleepers, which gives guests sleeping space for up to 12 people, three or four bathrooms, a fully furnished living room with a large TV & DVD player, free high speed wireless internet, screened porches, kitchen and dining room space including - dishes, pots, pans, utensils, appliances, microwave, stove, oven, dishwasher, and refrigerator/freezer. A washer & dryer is also included.